The society was founded on May 23, 1913 by 15 physicians and businessmen in New York City under the name American Society for the Control of Cancer (ASCC). The current name was adopted in 1944. According to Charity Navigator the ACS is one of the oldest and largest volunteer health organizations. At the time of founding, it was not considered appropriate to mention the word 'cancer' in public. Information concerning this illness was cloaked in a climate of fear and denial. Over 75,000 people died each year of cancer in just the United States. The top item on the founders' agenda was to raise awareness of cancer, before any other progress could be made in funding research. Therefore, a frenetic writing campaign was undertaken to educate doctors, nurses, patients and family members about cancer. Articles were written for popular magazines and professional journals. The ASCC undertook to publish their own journal, Campaign Notes, which was a monthly bulletin with information about cancer. They began recruiting doctors from all over the United States to help educate the public about cancer. In 1936, Marjorie Illig, an ASCC field representative, suggested the creation of a network consisting of new volunteers for the purpose of waging "war on cancer." From 1935 to 1938 the number of people involved in cancer control in the US grew from 15,000 to 150,000. According to Working to Give, The Women's Field Army, a group of volunteers working for the ASCC was primarily responsible for this increase. The sword symbol, adopted by the American Cancer Society in 1928, was designed by George E. Durant of Brooklyn, New York. According to Durant, the two serpents forming the handle represent the scientific and medical focus of the society's mission and the blade expresses the "crusading spirit of the cancer control movement." John R. Seffrin, former CEO of the American Cancer Society, received $2,401,112 salary/compensation from the charity for the 2009-2010 fiscal year. This is the second most money given by any charity to the head of that charity, according to Charity Watch. The money included $1.5 million in a retention benefit approved in 2001, "to preserve management stability." Mr. Seffrin's compensation for the fiscal year ending August 31, 2012 was $832,355. 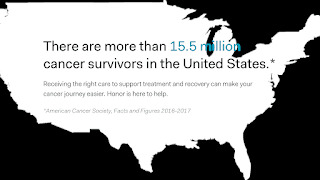 The Better Business Bureau lists American Cancer Society as an accredited charity meeting all of its Standards for Charity Accountability as of January 2012. Charity Navigator rates the society two of four stars for fiscal year 2011. According to Charity Navigator the society is directed to "eliminating cancer" and destroying it. Charity Watch rates American Cancer Society a "C", stating that the Society devotes 40% of its annual expenditures to administration, fundraising, etc., with the other 60% going to fund programs.